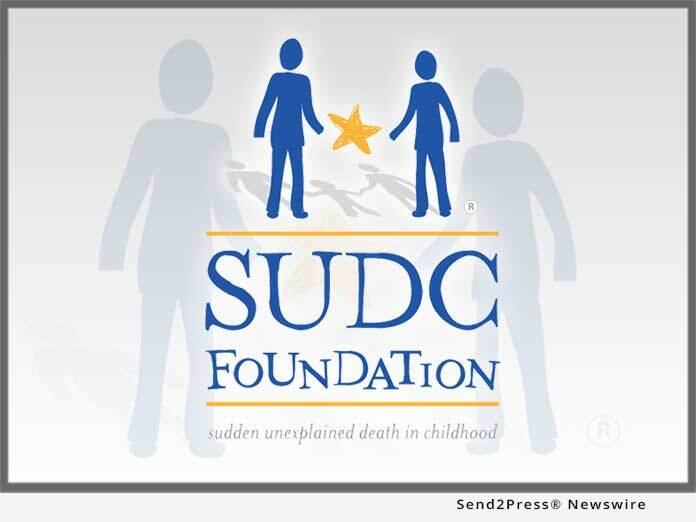 ROSELAND, N.J., Apr 12, 2019 (SEND2PRESS NEWSWIRE) -- The SUDC Foundation is pleased to support Scarlett's Sunshine on Sudden Unexpected Death Act, legislation reintroduced by U.S. Senators Bob Casey (D-PA), Johnny Isakson (R-GA), Sherrod Brown (D-OH), Doug Jones (D-AL) and U.S. Representatives Gwen Moore (WI-04), Tom Cole (OK-04) and Jaime Herrera Beutler (WA-03) to combat sudden, unexpected infant and child deaths. The legislation was introduced in honor of Scarlett Pauley, who was lost to SUDC in January 2017 when she was just 16 months old. "This legislation is named 'Scarlett's Sunshine' after a little girl who was lost to Sudden Unexplained Death in Childhood," said Senator Casey. "I wanted to honor Scarlett's memory and make sure that the federal government is taking all possible steps to ensure that no family will have to suffer the death of a child, without knowing why. It's appalling that approximately 400 children ages 1-18 and over 3,600 infants each year are dying from these unexplained causes. I urge my colleagues to join us in this bipartisan, bicameral effort." "I'm honored to join my colleagues in reintroducing this important bill in memory of Scarlett Lillian Pauley and to help prevent the unexpected deaths of any more beautiful children in our community. No one deserves the heartache of losing a child. Not knowing the cause only compounds this awful pain. This issue hits close to home for me as my own state, Wisconsin, struggles with high infant mortality rates among African Americans. And to be clear, SUID/SIDS/SUDC is not a parenting issue. Parents, regardless of background or economic status should not have to live with this uncertainly and fear of losing their precious children and babies, and we're teaming up to do something about it," Congresswoman Moore said. "While it is the fifth leading category of death among children ages 1 to 4, SUDC has not been directly addressed in our federal policy in regard to surveillance, research or prevention strategies," said Laura Gould Crandall, Executive Director and Co-Founder of the SUDC Foundation. "We can and we must do better. We applaud Senator Casey's and Congresswoman Moore's leadership on behalf of SUDC families worldwide and look forward to working with them to achieve our mission of a future free of SUDC." "On January 8th, 2017, our lives were shattered when our beautiful, healthy, thriving daughter, Scarlett Lillian Pauley, went to sleep and never woke up. And we do not know why," said Stephanie Zarecky and Ryan Pauley. "Losing a child is the single greatest pain we could ever imagine and living without answers magnifies the tragedy exponentially. We try every day to spread Scarlett's Sunshine, allowing her memory to shine on and bring light to SUDC, the medical mystery that took her from us. We thank Senator Casey and Congresswoman Moore for their leadership on Scarlett's Sunshine on Sudden Unexpected Death Act in honor of Scarlett and all of the other children who are deeply loved and missed." If passed into law, Scarlett's Sunshine on Sudden Unexpected Death Act would supply grants to help states, municipalities and nonprofits improve data collection and death scene investigations related to unexpected infant and child deaths, promote safe sleep practices and ensure death reviews are completed for 100 percent of infant and child fatalities. Currently, there are no nationwide standards for investigating and collecting data following an infant or child death. This makes it often impossible to determine the causes of these deaths, and what strategies our country can implement to prevent these tragedies. This bill has been cosponsored by Josh Gottheimer (D-NJ), Yvette D. Clarke (D-NY), Cathy McMorris Rodgers (R-WA), Susan K. DelBene (D-WA), Debbie Wasserman Schultz (D-FL), Peter King (R-NY), Betty McCollum (D-MN), Raúl M. Grijalva (D-AZ), Eleanor Holmes Norton (D-D.C.), Ro Khanna (D-CA), and Matt Cartwright (D-PA) in the House of Representatives. It has also been endorsed by the American Academy of Pediatrics, March of Dimes, Children's Hospital Association, Cribs for Kids, First Candle, KID: Fighting for Product Safety and the Aaron Matthew SIDS Research Guild of Seattle Children's Hospital.